One of the best views overlooking Lake Trasimeno, this home is also your own private spa that offers you the opportunity to abandon yourself to true luxury. Secluded and private, yet easy to reach, this house sits on the slopes overlooking the northeastern side of the lake. Picture perfect views are found from every window. Easy access to Assisi, Perugia, Umbertide, Todi, Gubbio and Orvieto in Umbria and the southeast corner of Tuscany including Cortona, Arezzo, Montepulciano and Pienza, this house is an ideal location for enjoying a wide area of Italy including Viterbo in the adjacent region of Lazio. Walk to town ( 1.5 kms) to a small village. This house has been transformed into a personal spa. Built into the gentle sloping side of the hill, on three levels, the top floor has two luxury bedrooms with soft pastel washed walls furnished in beautiful antiques with plush bedcovers each having their own private bathrooms that include hydro massage tubs or showers. And an incredible wide view of Lake Trasimeno, which glimmers like a jewel from sunrise to sunset.The ground floor of the house has been converted into the living area with soft colored walls of patina beige, linseed polished ancient terra cotta floors and ancient dark chestnut-beamed ceilings. This floor consists of the dining room, living room with upholstered furniture and a flat panel TV. The very charming country style eat in kitchen with a soft colored off-white kitchen hutch, stone backsplashes and marble countertops offers up all modern appliances and a large refrigerator. The Pièce de résistance (pardon our French) is the incredible spa room in the subterranean floor. This room has a bank of glass panels that allows you panoramic views that stretch beyond the large stone terrace, the outdoor swimming pool and Jacuzzi. This room is your own private spa with a large indoor swimming pool in which the water is circulated by a 10 foot waterfall cascading over an illuminated stone wall, a dry sauna and private areas of relaxation with sofas and chaises. Summer is wonderful on Lake Trasimeno. If you can bear to tear yourself away from this private retreat, you are only minutes away by car to the second largest lake in Italy. At the lake with its man made sandy beaches you will enjoy swimming, volleyball, sailing, windsurfing. and other water activities. There are designated areas for children to play. Chaise lounges, umbrellas and pedalloes can be rented, restaurants and cafes line the beaches. The ferry takes you to two islands where you can trace St. Francis' steps and visit the ruins of his Monastary, admire ladies making lace and relax in the cafe's and restaurants. Enjoy bird scanctuaries near Castiglione, Magione and Lake Montepulciano. Golf in the nearby courses the challenging 9 hole course in Lambourghini, or the 18 hole courses in Perugia and Antonella. For the art and history, you can explore the many Etruscan, Roman and Medieval hilltop towns. Visit many of St. Francis of Assisi's resting places, take a vineyard tour and tasting, soak in a thermal bath, dine or wine al fresco or just stop for a gelato or cappuccino on the many sidewalk and lakeside cafe's while listening to local musicians, visit one of the many music festivals during the summer including the very famous Umbria Blues, Gospel and Jazz festivals. Classical and popular concerts spring up everywhere, colorful markets selling fresh produce, clothing and household items abound. The area is bustling each summer with more activities than you can pack into your stay, and of course, you have to have some down time to relax at your very special home away from home. This villa spans three floors, with a lower level, ground floor and first floor. Here you find the spa room. There is a swimming pool with waterfall, sauna room and little areas of tranquility which have chairs and sofas for relaxing moments. This large subterranean room has a wall of windows that let in the natural sunlight and overlooks the outdoor jacuzzi and swimming pool in the backyard. A doorway leads to a double bedroom with en suite bathroom and the laundry room. Because this bedroom is furnished simply, and next to the indoor swimming pool, we do not recommend using it. This floor consists of the living spaces of the villa, reached by an external staircase. You enter the cozy yet fully equipped eat in kitchen and pass through a doorway into the dining room of creamy carmel-washed walls and burgandy accents. From the kitchen another doorway opens up to the living room with flat screen TV and comfortable upholstered furniture. A staircase from the living room takes you up to a double bedroom with en suite bathroom and flat panel TV. Large glass doors open up to the terrace that overlooks the outdoor swimming pool. An outdoor staircase takes you to the master bedroom suite, with a queen size bed, an en suite bathroom, flat screen TV and a small studio which can double as a bedroom for children. Staying with the Spa theme, all three bathrooms have hydra massage tubs or showers. Beautiful terraces at the lower lever and first floor have views of the lake and the countryside. 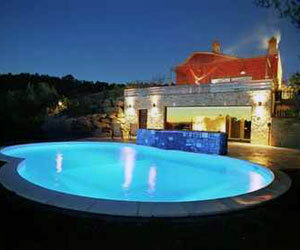 The outside swimming pool with hydro massage is immersed in the olive groves and is also visible from the glass wall placed right next to the inside swimming pool. Enjoy spacious terraces, the barbeque area and, of course incredible vistas of Lake Trasimeno and the Umbrian countryside! Please Note: there is an addtional Twin/King Bedroom in the basement with the indoor swimming pool and sauna. This bedroom is simply furnished and we recommend it only for teenagers. Private Inground Pool, 9 x 16 meters, Jacuzzi, Air Conditioning, Fireplace, Beach, Views, Panoramic views throughout entire villa - even in the bathrooms! Indoor and outdoor swimming pools both with hydro massages and one with waterfall. Addtional Bedroom in the basement with the indoor swimming pool and is not as furnished as nicely as the rest of the house. We only recommend this bedroom for teenagers.